In this post, I have written about a Bhoot Pret Siddhi Mantra Sadhana, meaning a Mantra Sadhana to appease ghosts, zombies and similar entities and maintain cordial relations with them. The Mantra Sadhana tries to invoke both male and female ghosts and zombies. 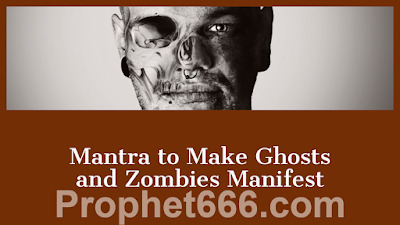 This is not a Bhoot-Pret Attraction or Vashikaran Mantra or a Mantra to bind ghosts or zombies and make them perform tasks or tell you about the past and future. Exactly what can occur if the ghost of zombie appears is uncertain and cannot be per-determined. The outcome of the possible encounter depends upon the practitioner and how he conducts himself. The simple procedure of appeasing the entity has been given. If the entity appears and the practitioner looses his nerves and gets terrified, it is most likely that he might get possessed, turn into a lunatic or even loose his life. Hence, this Mantra Sadhana is only meant for advanced Sadhaks and practitioners of Aghori and Tamas Guni Mantra Prayogas. The simple and easy method of performing this Bhoot-Pret Siddhi Sadhana has been described below. The practitioner has to perform the Sadhana under a Bargad Ka Ped and chant the Mantra given below 8000 times, using a Rudraksha Japa Mala. While chanting the Mantra, he has to keep a Kalash filling with water, mixed with Gandham and the Chameli Ka Ittar, next to him. When the Bhoot-Pret or similar entity manifests before the practitioner, the practitioner has to offer Arghya of the contents of the Kalash to that entity. Note- The other details, like date, timing, Aasan and Disha have not been prescribed for this Sadhana because as mentioned above, the Sadhana is only meant for Advanced Sadhaks and they can perform the Mantra Sadhana according to the procedure, which they usually follow.